Scalable – The system grows with your tasks – from a start-up to an established company with a branch structure. Competent -– We support you in configuring the system and optimising your processes. Everything at a glance: The key data on companies as well as web services with further information are clearly presented. 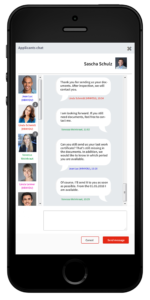 Manage your contacts and control the entire communication directly via the software. Assign target groups, industries, company and sales classes in order to structure your internal responsibilities and campaigns. a wide variety of filter options is available. All relevant content can be stored and tracked in the respective project. 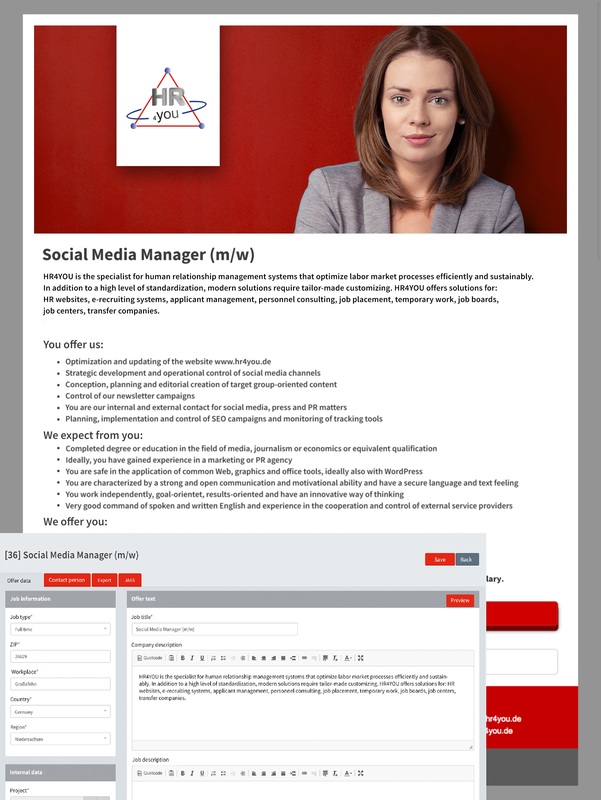 Job advertisements receive your corporate design and are created responsively. Your jobs are managed and archived clearly. In advertisements, functions for direct online application and recommendation in social networks can be integrated. You can achieve a broad diversification by forwarding to job exchanges, meta search engines, social media services and employment agencies. 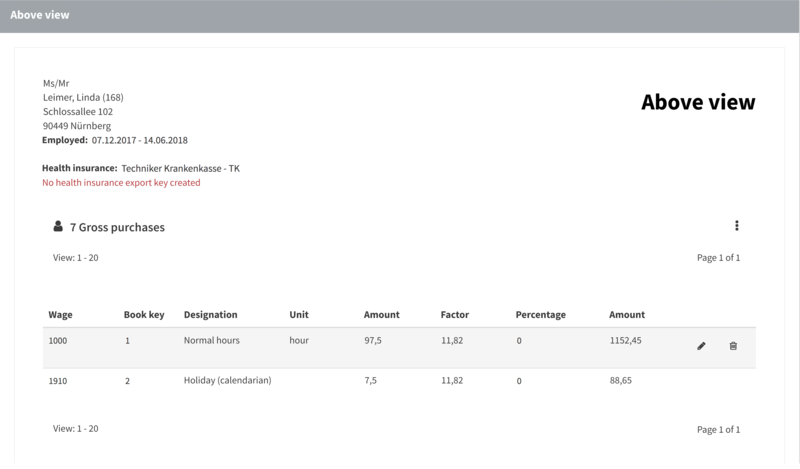 Interfaces to all relevant portals can be integrated; also fee-based portals can be populated directly via HR4YOUeTemp. In order to receive a response from good applicants, it is important that the job advertisement has a wide reach and the application process is as clear and positive as possible (candidate experience). 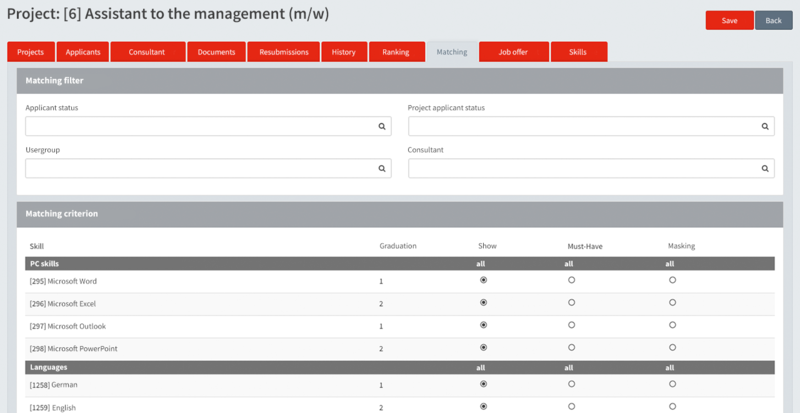 HR4YOU-eTemp allows a wide variety of application channels to be processed quickly and transparently. Online application forms can be designed flexibly and configured specifically for mobile applications. 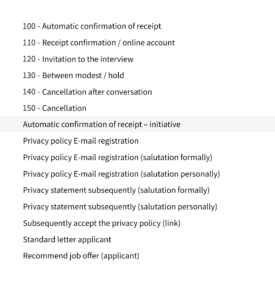 Email or postal applications are transferred to the system at the push of a button and read out in a structured manner with the support of a CV parser. 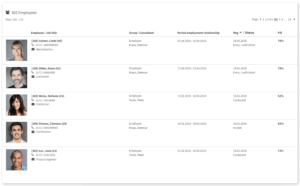 Find the right candidates for open positions at the push of a button. 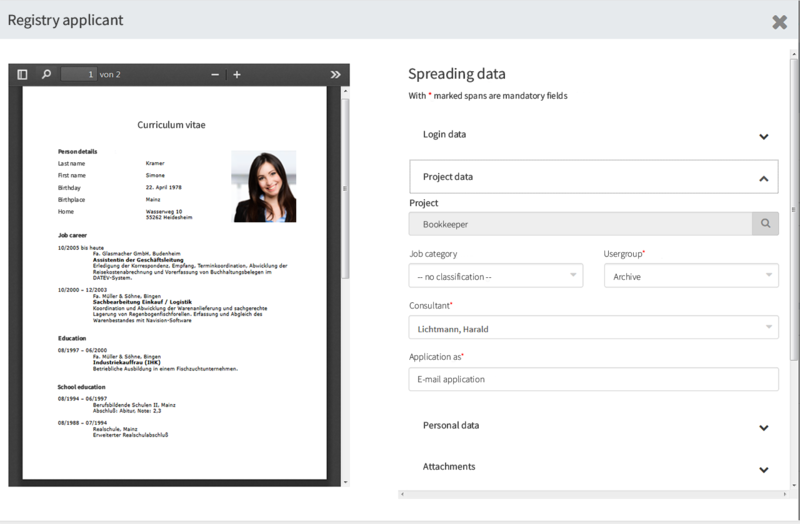 Searching is possible both via a structured skill matching and an integrated full text search in all applicant documents. 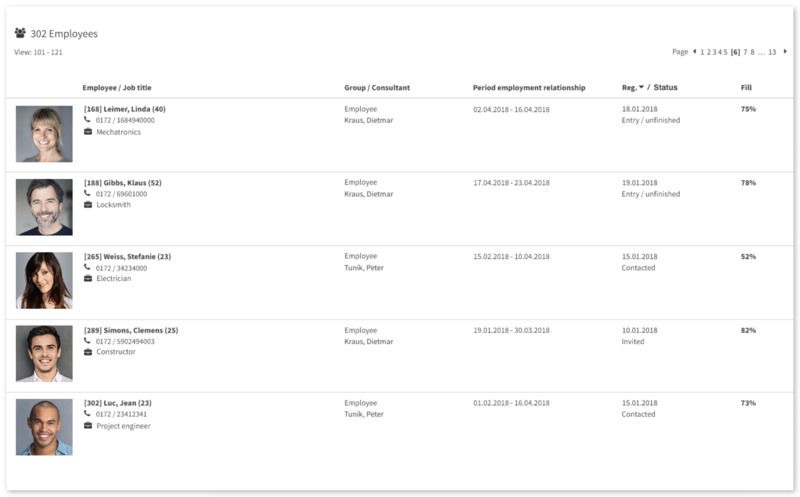 Do not only search in your pool of existing employees or candidates, but also use integrated active sourcing functions to search external networks for top candidates. Once you have found suitable candidates, it is important to present them to your customer as a precise match. 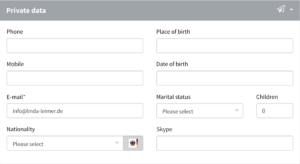 You can generate both open and anonymised profiles and also have the option of generating a large number of different profile variants for a candidate. The output is converted into a bespoke layout at the push of a button. Customers are integrated via a password-protected link. 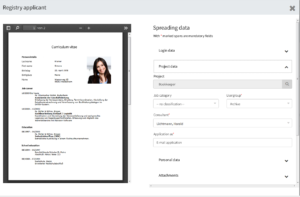 This gives the recipient access to a clearly structured profile book with all relevant candidate information and documents. 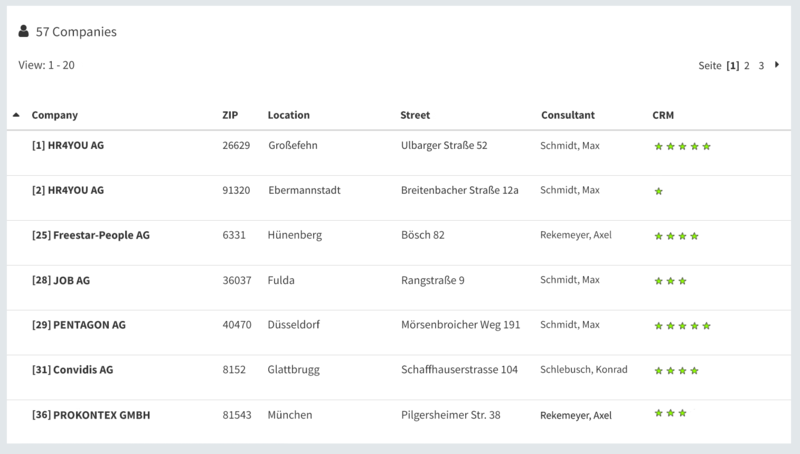 The customers also receive an integrated feedback function via the profile book in order to communicate quickly with the responsible dispatcher. 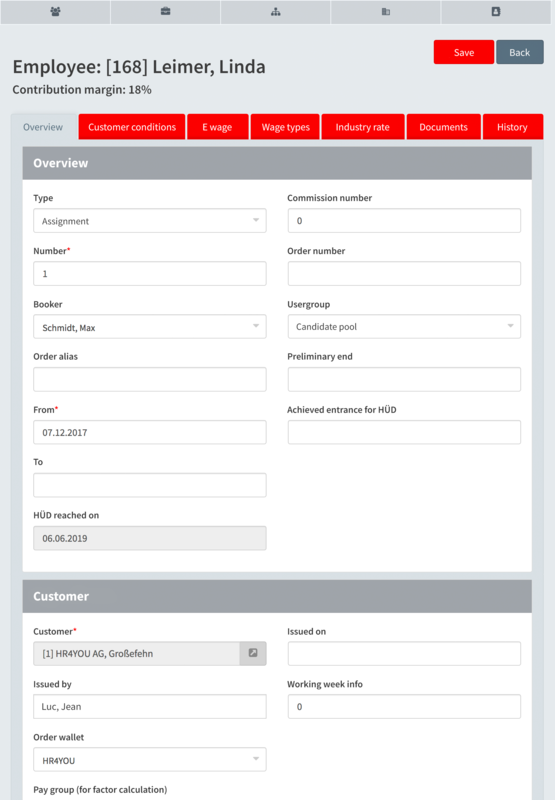 All active or completed orders can be viewed per customer and department. Within the individual order, specific conditions can then be viewed and adjusted as required. Information on industry rates, on the calculated maximum personnel leasing period and on the start of equal pay are clearly displayed. 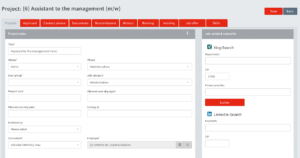 The personnel leasing contract can be generated and monitored directly via HR4YOU-eTemp from the stored information. 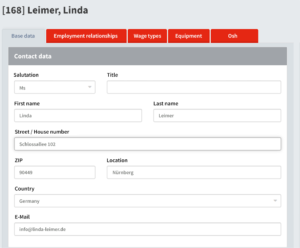 With this setting, an applicant becomes an employee at the touch of a button and is stored with all master data. 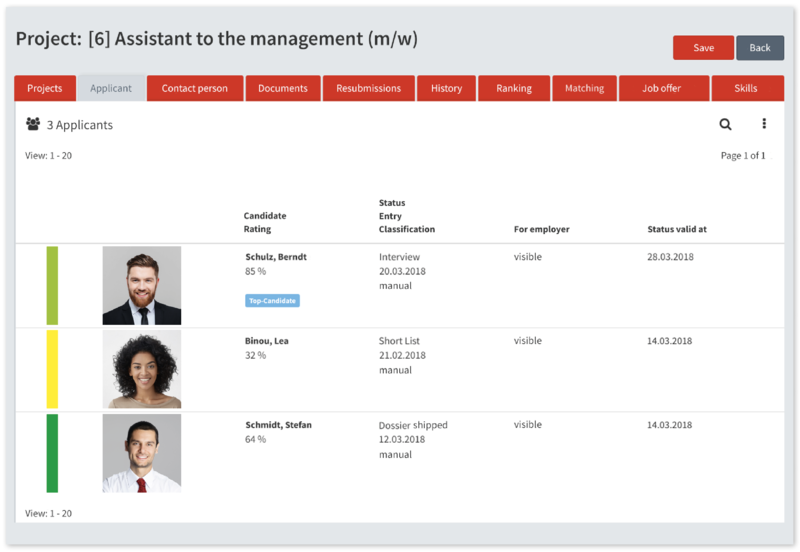 All necessary documents, such as the employment contract and initial training, can be generated directly via the system. It is also possible to manage all instructions with validity date and work equipment handed over to the employee. 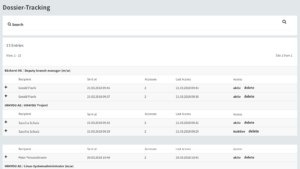 In the usage overview, the dispatcher receives a formatted display of all current deployments together with various filter options. 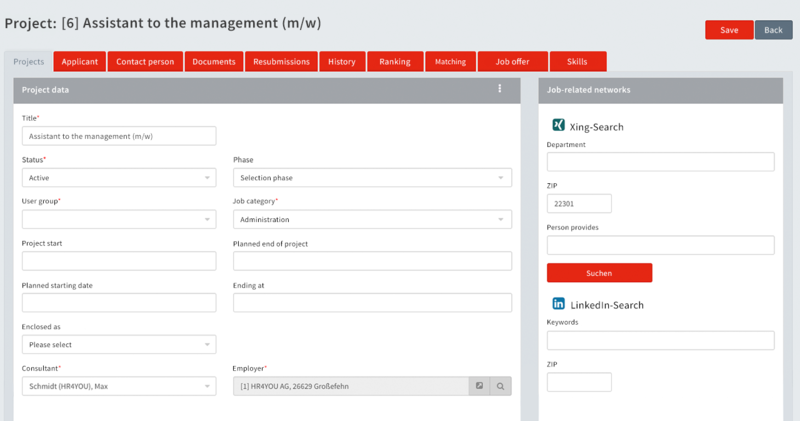 HR master data: Personnel number, entry date, work permit, social insurance data etc. Hours can be recorded directly online, via keyboard control or from electronic time recording. 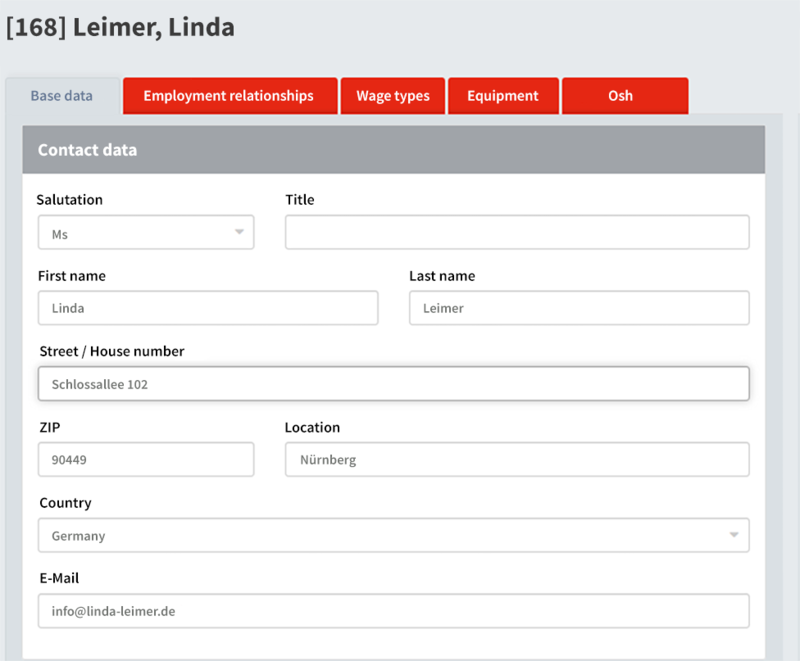 With an additional module, time recording by the employee is also possible. 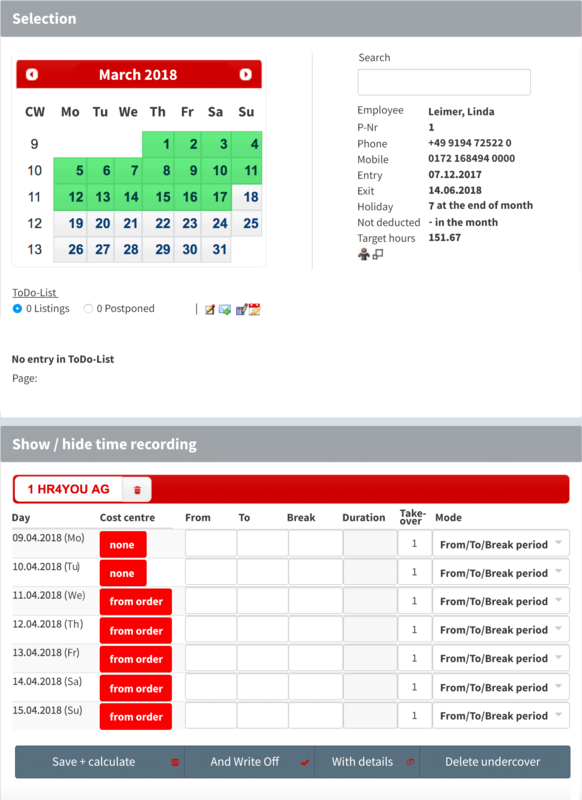 Colour markings indicate missing entries in the calendar overview. Missing time sheets are displayed as reminders. 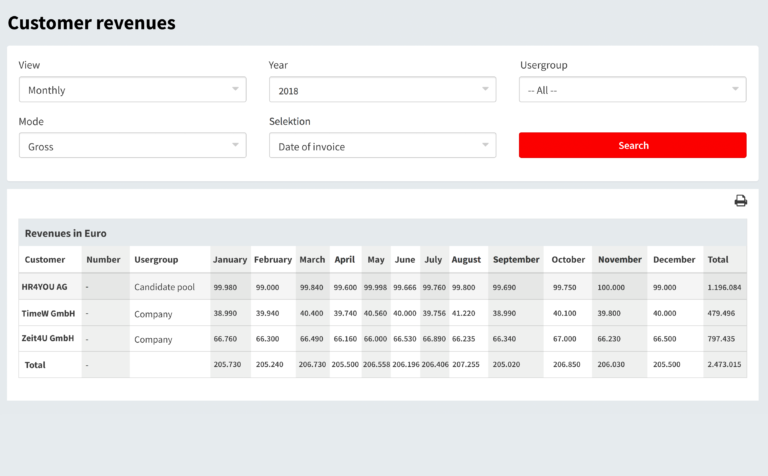 The wage and invoice data is automatically calculated from the stored order terms and clearly displayed on a two-part screen for the dispatcher. 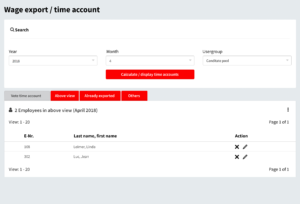 An invoice is created from the recorded hourly data at the push of a button. The invoice items can be compiled and printed by the dispatcher in various ways. 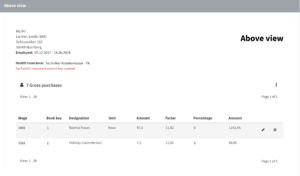 This makes it possible to include several employees or orders within one invoice. When the invoice is sent, it is transferred directly to the open item list. average hours and daily rates of absences is automated and simple reconciliation of the time account is guaranteed. Communication with customers, applicants and employees via email, letter or text messaging is stored chronologically in the history. 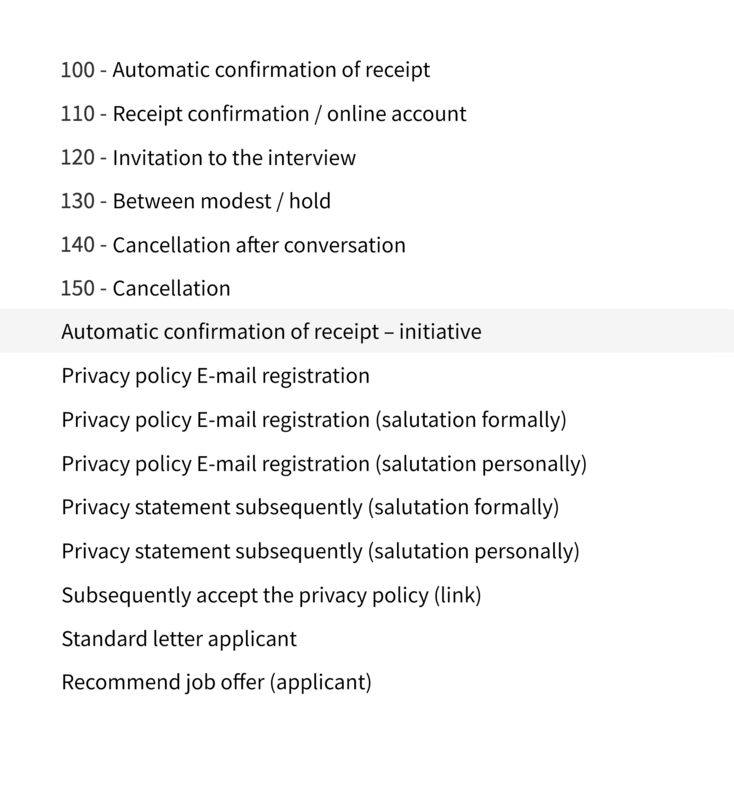 Predefined standard documents such as confirmation of receipt, rejection or invitation can be sent manually, automatically or as collective emails. The creation of employment contracts and personnel leasing contracts is also integrated. The telephone system can be linked to the system. 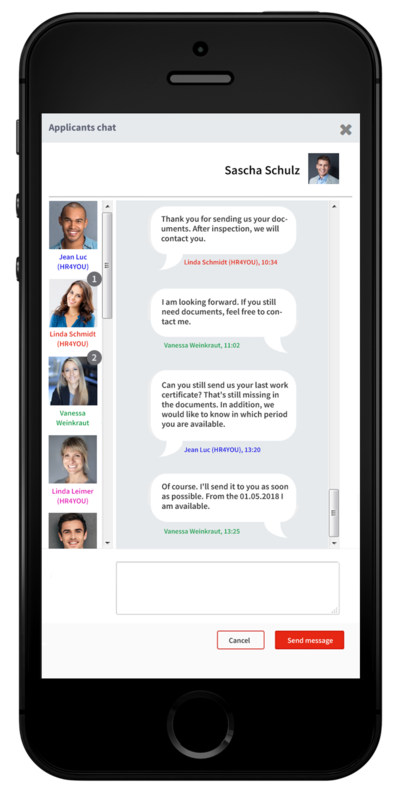 There is a comprehensive follow-up system for task management and internal communication which can also transfer appointments to an external calendar. You can generate comprehensive statistics and analyses to measure your performance and for further strategic planning. These can be generated either time-controlled, ad-hoc, or via predefined process steps and actions. There are analyses for measuring success at the level of individual dispatchers, branches or the entire company in relation to the entire leasing process. When leasing employees, numerous legal provisions, deadlines and organisational regulations must be kept in mind. All relevant deadlines are monitored in the personnel leasing cockpit and displayed with an appropriate warning function for the dispatcher. 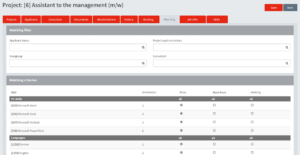 This gives you an overview at a glance of expiring deployments, instructions, sector tariff and equal pay deadlines and allows you to take proactive countermeasures. 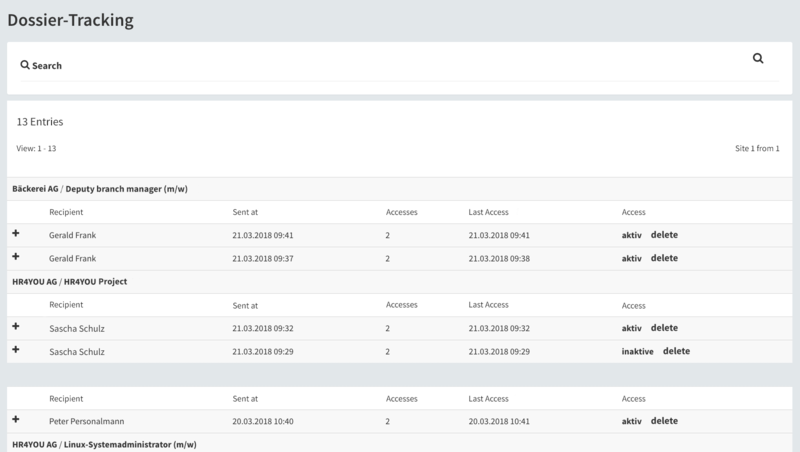 In the course of the implementation of the EU GDPR, a deletion and anonymisation routine is also stored within the system, so that you can also automatically and legally map the retention periods for personal data in the future. 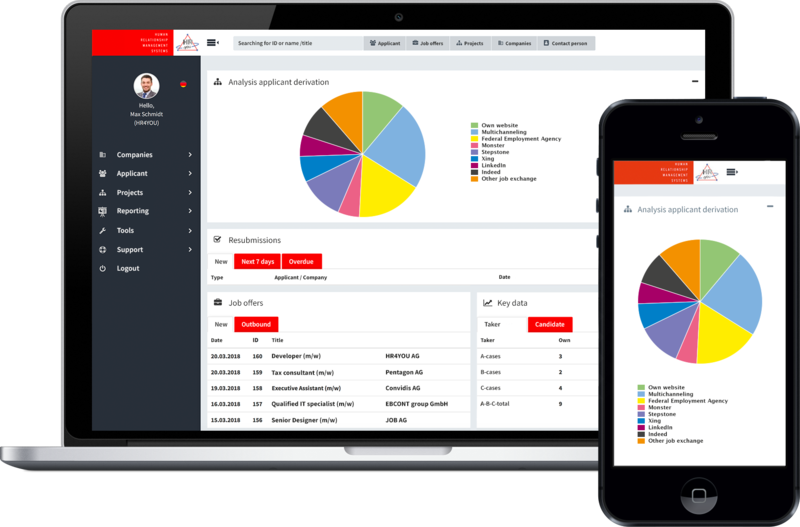 Analyses for all relevant business processes: Key sales figures, applicant origin, turnover overview per customer and branch, contribution margin calculation, post-calculation, accrual report, special working time analysis, health statistics, etc. 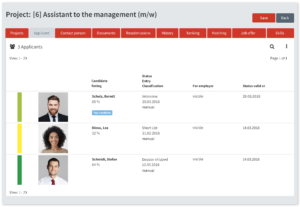 The HR4YOU-eTemp temporary employment software is compatible with the DATEV-LODAS and DATEV-Lohn und Gehalt solutions. In addition, HR4YOU is certified by DATEV eG as the provider of the interface. The DATEV interface is thus technically tested annually and is therefore always up to date. Further information on DATEV eG can also be found here.